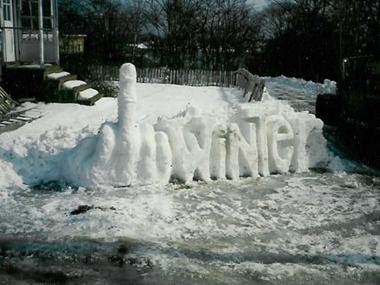 That snow sculpture has a mixture of uppercase and lowercase letters, which weakens its impact. I would send the artist to igloo school for remedial lessons. Not only is the sculpture a wonderful work of art, but it appears the artist has cleared the driveway of the nasty white stuff that I so hate...Would he be interested in doing a carving and clearing my sidewalk of snow? @ Mr. B: Funny thing is he applied to igloo school, but although they felt that his subject did not lack creativity, it was his lack of perspective on the middle finger that was disproportionate with the hand, and thus required more work. So he'll have to reapply next year. @ Greg: Since we're talking about Charlie Sheen (touted as the world's fastest/most creative snowblower as part of his rehab); he cleared the driveway and created the snow sculpture with nothing but a razor blade, a hundred dollar bill, and his nostrils in FIVE minutes, AND since his application was declined by igloo school-he's available. Just keep your wife and daughter away from him. I said, ya better hide yo wife, hide yo kids, coz Punxsutawney Sheen is rapin' everybody out here! I don't know why your blog lists "Arthur C. Clarke Dies at 90" as a blog related to this topic... but I am beginning to formulate all sorts of conspiracy theories about the man's death now. Oh yes & it's sunny, 70 degrees with an 8 mile an hour wind here where the west was won or lost (depending on who you were rooting for). @LoriGVW at the time I wrote the "Arthur C. Clarke Dies at 90" article, he had died of natural causes. I had little to nothing to do with it, unless you count my horribly bad attempts at '2001: GWB a Space Oddity' and '2010: Revenge of the Obama' jokes next to his deathbed, of which I am INNOCENT. INNOCENT I SAY!! ...and Google just seems to lump all my horribly bad attempts at humor in one neat little stack or pile for your viewing pleasure. It's as random as drawing comparisons between apples and oranges to point out a lack of comparisons when they are both delectable fruity morsels...so, wtf? Also, would the West have been won if one was rooting for the Spanish, or has it been lost forever because of the Italian organization of amateur photographers...the papparazi? The endless ice age is causing violent, wacky upheavals in Egypt. If it would just stop snowing for a few days, Crackers The Chimp could ride the happy train and focus on the act of fondling himself. @7masterheathen From what I've heard, Crackers The Chimp is skiing in Egypt.